Check out this very helpful list of sites on Adventures in Low Vision…Thanks for sharing with us! I’m unveiling a new feature on Adventures in Low Vision today, my Low Vision Blogroll. I wanted to highlight a few resources for living with a visual impairment. On the right sidebar you’ll find alphabetized links to organizations and personal blogs that I find helpful and/or interesting. Have you visited any of the sites? Tell me about the sites on living with a visual impairment you recommend in the comments section so we can all benefit from them, too. 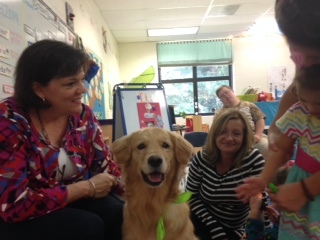 Sophie and I often visit school classrooms. 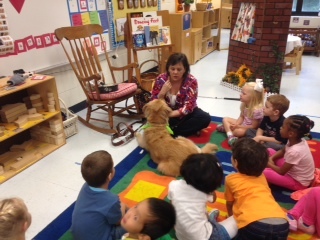 Today we were invited to Oak Grove Elementary to speak to the pre-k class about guide dogs. This class has several students who are visually impaired and the teacher just completed a unit on “pets.” I shared a storybook with the teacher about a guide dog and she read it to the children ahead of time. So they were well prepared and very excited to meet a real live guide dog. We talked about Sophie’s very special job – to take care of me and keep me safe. They learned that working dogs usually have a harness or vest for their “work clothes.” I described how Sophie went to a special “dog college” to learn her job and that I had to go to the same school to learn how to work with Sophie as a team. We discussed how important it is to not pet or talk to working dogs while they are doing their job. 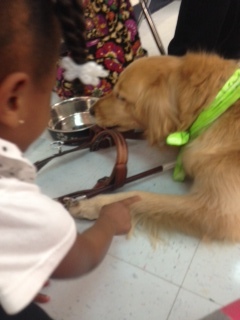 The kids learned that they should ask permission before petting any dog, especially service dogs. I asked the children to think about all the things a dog needs to be healthy and happy. They came up with food, water and treats. I brought Sophie’s brush and a toy to tell them that she needs grooming and time off to play like other dogs. They learned that Sophie also needs exercise and her teeth brushed, just like them. But most importantly, I told them she needs love, praise and affection so she knows that I appreciate the work she does for me. I gave them examples of the ways she takes care of me like helping me to cross a road safely, go down stairs, and find my way out the door. She takes care of me and I take care of her; we are a team. All the while, the children sat on their squares, containing their wiggles and giggles. Then I took off Sophie’s harness and invited them to brush and pet her. Sophie weaved among them sniffing, giving wet kisses, and swooshing her beautiful, happy tail. The children squealed with delight. Some were eager to brush her and pet her, others not so much. 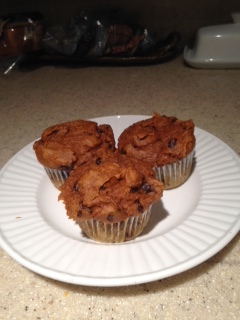 Sophie brought some of her favorite treats to share with the kids so they could give their doggies a treat at home. It was a good day with some important lessons learned. In my retirement, I have been exploring new ways to be physically active. I have always walked for exercise with my guide dog. We mapped out several routes in my neighborhood and enjoy this special time together. But walking just didn’t seem like enough and I was experiencing changes in my balance, muscle strength, range of motion, and stamina. As a visually impaired person I had become less physically active and I didn’t like the way I was feeling. I have put on weight and have been suffering with low back pain. I needed to move all my muscles and joints and strengthen my whole body. As I age, I want to be able to rely on my body to allow me to do the things I want to do. If we give our amazing bodies what they need, they will perform what we ask of them. So now that I have time on my hands, I am investing in my health and well-being. I discovered the “sports and fitness” channel on TV and began to do Pilates, dance, and yoga programs in my living room. 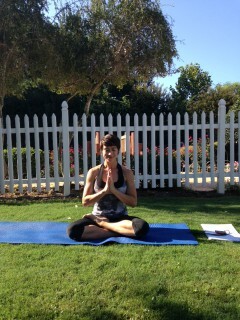 This proved to be a great place to start and helped me loosen up and get back into regular exercise. These programs are “on demand” selections and there are hundreds to choose from with a wide variety of workouts. Though I was sore at first, it felt so good to be moving again. After a few months of these home workouts, I wanted more. I considered joining a gym, though in the past that didn’t always work out since I do not drive and have to find rides. There happened to be a new gym opening up in our area and we checked it out. It turns out that this new gym offered a great deal; affordable pricing, no contract, and no sign up fees. In addition, the membership allows for a free guest with each visit. This was perfect — I could invite friends to drive me and stay to work out for free. And so for the last few months, I have been able to visit the gym consistently and explore all that it has to offer. 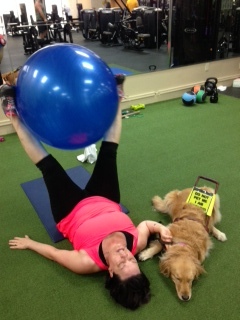 The management and trainers were very helpful in orienting me to equipment and welcoming to my guide dog Sophie. I learned the weight machine circuit and how to set the different cardio machines, carefully navigating the maze of equipment with Sophie or my white cane. When I first joined, I mostly took advantage of the water aerobics classes which were easy on my lower back problems. My back improved as I strengthened my core muscles. Then it was time for a bit more challenge. I stepped up my game by adding 30-45 minute workouts on the elliptical, treadmill and stationary bicycle, alternating. And I began doing the weights twice a week as well. The gym recently added Pilates and yoga classes, which I have thoroughly enjoyed. Yoga has been such a surprisingly delightful way to move and work my body. It involves posing in ways that stretch and engage your muscles, heating them up and fatiguing them. Breathing technique is also important when practicing yoga, I am learning. My instructor AJ has a wonderful way of leading us “baby yogis” through the poses, giving verbal cues and tips on how to get the most out of the movements. As she talks about “creating space” within our bodies, I am aware of new sensations and movements of which my body is capable. When my muscles shake in the “hovering cat” position or burn as I hold a balancing pose, I know I am doing something healthy for my body. As AJ says, “It feels so yummy!” It is a delicious experience being anchored to the earth and unifying your mind and body as you go through the routine, interspersed with moments of relaxation in “child’s pose.” My favorite part of class is doing our “oms,” which AJ calls a massage of our central nervous system and a chance to project our voice. This is followed by the “corpse pose” when we are challenged to rest, empty our minds, and breathe deeply for two minutes…heavenly! What a wonderful feeling I have when I leave the class, ready to take on the day! I have already seen many changes and benefits to my body as a result of these new activities. My balance has improved, I am losing weight, my clothes fit better, my moods are stable, and I am sleeping soundly. My lower back and joint pains are improving too. Another benefit of going to the gym has been making new friends and being inspired by the environment. Our bodies are incredible machines and require motion and maintenance. Give your body what it needs and it will give you what you want – quality of life. If you are doing nothing in the way of exercise, do something! If you are doing something, do more! Enjoy your body in motion! I don’t want to be blind when it means being conspicuous. I don’t want attention for what’s different about me. I don’t want passers-by holding their breath as I cross the street. Today, I want to blend in with the crowd, to be one of the guys. I don’t want to be blind when it means being tended to. If you insist on telling me I don’t look blind or act blind, then stop treating me like I’m helpless. I don’t want Sunday dinner becoming a hot mess of what I can eat gracefully or who will read me the menu. I don’t want the guilt of you taking on my anxiety and then not knowing how to handle it. Yesterday was “get out of the house day.” My husband and I laid aside our Saturday chores and opted for a trip to Atlanta. We had a full day of activities planned. We wanted to do some walking, check out a new restaurant, and shop at a store I have never been to before. I packed for the adventure, including food and water for my Sophie girl. She was just as excited as I was to “get out of Dodge” and get some exercise. First stop was historic Oakland Cemetery. I love walking around old cemeteries and reading the gravestones. This garden sanctuary dates back to 1850 and is full of Atlanta stories and history. There are beautiful old live oaks and magnolias that cool off the brick paths. The ornate monuments and wrought iron gates are stately and showy. There is unique sculpture and architecture marking the final resting places of Atlanta’s dignitaries. We strolled peacefully among the headstones and my husband read them to me. There were soldiers’ graves from the Civil War and tiny crooked markers of infants who died prematurely. One of my favorites today was a husband’s stone which read, “All I ask of you is forever remember me as loving you.” Such a touching testament to eternal love…the words stayed with me all day. Despite the shade and coolness among the trees, the day was heating up. Sophie was panting but being a trooper. She did a great job guiding me around broken concrete paths and low hanging tree branches. We made our way back to the entrance gate. Sophie appreciated a long swig of cool water at the car and a relief break. Then just across the street, we walked to a pub called “Six Feet Under” which had great reviews and the promise of cold beer. We refreshed ourselves with some suds and seafood gazpacho…de-lish! Then we shared a lovely baked basa on a bed of spinach and some scallops and asparagus. The day was shaping up to be a real treat!